It is the first, and only, house of worship in San Francisco to be granted this honor. 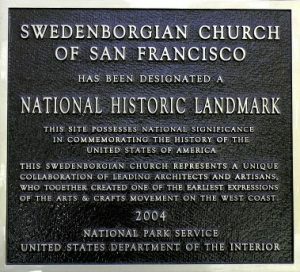 Additionally, the church is the first privately owned building to be designated a Landmark since the Bank of Italy in 1978, and first Landmark of any kind in San Francisco in more than 15 years. It was granted “Level Four” Landmark status (the highest available) on August 18th, 2004, by U.S. Secretary of the Interior Gale A. Norton. The Church opened its doors for worship March 17, 1895, and was designed by a distinguished group of architects including the celebrated Bernard Maybeck. Its founding pastor, Rev. Joseph Worcester, was longtime friend of John Muir. Rev. Worcester purchased the land on which the Church and its grounds are located.